While ice cream has near-endless merits, cookie dough ice cream is too often just a pretense for consuming cookie dough in a socially acceptable fashion. But it's 2018, folks. It's time to be honest with ourselves about our desire to eat cookie fetuses. Leading this charge is Ben & Jerry's, which just delivered unto us Cookie Dough Chunks. What are Cookie Dough Chunks you ask? Well, chunks of cookie dough as they naturally occur, without putting on any ice-cream airs. The dough will come in a 1/2 pound bag containing 8 servings of the chunks. 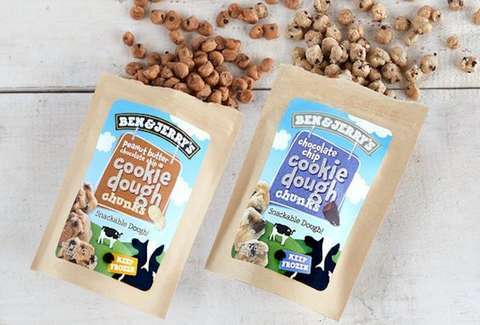 It'll be "the exact same dough" you know and love from the ice cream and will be safe to eat because Ben & Jerry's is using "pasteurized eggs and heat-treated flour." It'll also come in both chocolate chip and peanut butter flavors. Yes, unfortunately, this snack is only available in Vermont for the time being as part of a market test. For now. So, uh, don't mess this up Vermont.